You'll get great performance, but at a steep price. The Acer Predator 17 X is a well-performing gaming laptop, but the prohibitive price and dated hardware are questionable. 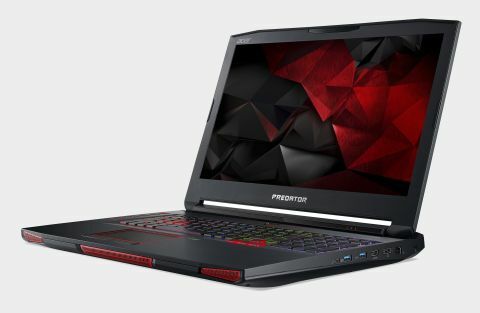 Acer’s Predator line of laptops and desktops are marketed as the manufacturer’s high-end gaming machines, designed for the most demanding games and the most discerning gamers. Maybe that sentiment has earned the 17 X a price tag of $2999.99, a daunting point of entry for anyone with a modest budget. While there are some aspects of the Predator 17 X that stand out, the whole package unfortunately falls short of justifying its $3000 asking price. Unboxing the Predator reveals a weighty system that’s decked out like a muscle car. Red highlights line its sleek black case, and the two 'exhausts' on the back wouldn’t look out of place on something like a Camaro. The look screams performance and sets a lofty bar for the laptop going forward. The full keyboard spans the length of the unit and boasts a number of features such as media controls and programmable macro buttons that allow switching between three different binding profiles. This is handy for setting up button layouts for separate games and productivity apps. The RGB keyboard backlighting is fully customizable to an impressive degree through Acer’s PredatorSense software. A full range of colors and patterns means you can highlight any keys in any color, and tailor the look of the keyboard to your liking. Typing and gaming on the keyboard is a joy. There’s enough room between the keyboard and the front of the unit to rest your palms, and the laptop is tilted just enough to comfortably reach the WASD keys. Typing documents in a word processor is a breeze, too, thanks to the smartly-spaced keyboard. It can be a tough balance to strike, but the Predator’s keyboard feels both spacious and compact enough that it never felt awkward to use. Among gaming laptops I’ve tested, this is easily my favorite keyboard. The 17 X also boasts Acer’s SoundPound 2.0, the best sound system I’ve ever heard on a laptop. Watching movies and TV shows is as immersive on this 17-inch laptop as it is on my home television thanks to the inclusion of four built-in speakers and two subwoofers, with two speakers located on the front of the unit and the subwoofers housed underneath. Gaming on the system is a real treat too, thanks to the stellar sound output. Gunfire and explosions are crisp and booming, and the sounds between the action, such as footsteps and reloading, are impressively clear. Speaking of gaming, the Predator handled our benchmark gauntlet admirably. The unit I tested came equipped with a GTX 1080 and a whopping 32 GB of memory. In Shadow of the Tomb Raider, the 17 X averaged above 80 fps on the highest settings across several tests at 1080p. Testing Total War: Warhammer II at the same resolution turned in an average of 71 fps, while the 3DMark Firestrike test resulted in a respectable 15200 score. At 1440p, these numbers dipped just a little, but not by much. Shadow of the Tomb Raider hovered around 60-65 fps, while Total War: Warhammer II came down to the mid to high 50s. When upping the in-game resolution to 4K, however, things slowed down a bit, especially in Ghost Recon: Wildlands. Running the game on Ultra settings at 4K turned in an average of 40 fps. Lowering the graphics settings to high bumped the fps up to around 60, so you’re going to have to make some concessions if you want to play in 4K. Still, the 17 X churned out solid gaming performance. Given the numbers, it shouldn’t be much of a surprise that the 17 X breezed through the productivity benchmarks. Cinebench scores hovered in the high 750s across four tests, while PCMark 10 gave me an average score of 3625. Thanks to the 17 X’s impressive cooling system, the unit never got hot to the touch even under stress. Acer touts what they call a “triple cooling system” that uses three fans to take in cold air through the front and expel hot air out the back. It performed exactly as advertised, and left the system cool and performance-ready. System vitals such as CPU temperature and overclocking options can all be viewed in the included PredatorSense software suite. (This is also where you can customize those programmable macro buttons.) The software is intuitive and simple to understand. Most options can be changed with just a few clicks, and it’s all presented in an easily-digestible format. Want to overclock your CPU or GPU? Click “Faster” or “Turbo” in the PredatorSense overclocking options. Through the software you can overclock your CPU up to 4.3 GHz and the GPU to 1732MHz. All this performance comes with a few caveats, however, mostly when it comes to the weight of the laptop. Unsurprisingly, cramming this much performance into a laptop results in a heavy machine, and at just over ten pounds, the Predator pushes the definition of mobile. Another side effect of this is an underperforming battery. On medium power settings, I only managed about four hours of battery life while watching Netflix, which makes binging shows tough. The disappointment is compounded by the outstanding SoundPound system; the idea of giving up such stellar sound performance thanks to a subpar battery stings. The Predator 17 X is also expensive. The model I tested is $2999.99. I understand that mobile gaming performance like this comes with a hefty price tag, but part of me gets giddy thinking about the desktop I could build with a budget of that size. The Predator also uses a 7th gen Intel processor, which makes me question why this machine is so expensive. At this price, you could snag yourself a high-end desktop system, like Acer’s own Predator line of towers. But even those are saddled by last-gen i7 processors, so as the cost stands right now it’s hard to recommend any Predator unit, really. With the i9s making their debut earlier this year, paying this much for a 7th gen processor feels questionable. In all, Acer’s efforts with the Predator 17 X feel admirable, but dated. The fact that it uses older hardware makes the prohibitive price tag an odd choice on Acer’s part. A great keyboard and immersive sound system are highlights here, but it’s hard not to recommend something else given how expensive this laptop is.